Rhode Island has recently been faced with flooding and coastal erosion issues that have garnered newspaper headlines. For a while there, people in the Midwest began to realize that Rhode Island and Long Island are actually two different places! Well, this is not how we want to draw attention to our little haven. The massive flooding in the spring of 2010 closed Route 95 and caused millions of dollars of damage. The coastal erosion problems along the south shore of the state have led to emergency measures being taken for areas such as Matunuck Beach, as they try to save business and residential property alongside one of Rhode Island’s best-known summer vacation spots. This erosion problem was unfortunately highlighted by the destruction brought on by Superstorm Sandy in 2012. A site-specific high-vulnerability area became a coastal nightmare along Photo Credit: Rhode Island Sea Grant the entire south shore, as well as in Narragansett and on Aquidneck Island, both of which incurred massive damage from the heightened storm surge that threw tons of sand and rocks inland from the beach areas. Climate change can and likely will exacerbate all of these problems as time goes on. Between rising sea levels and coastal population growth, whenever hurricanes make landfall, the damages they inflict will likely be greater than they have been in the past. With approximately 400 miles of coastline and an elevation that is at or near sea level in most areas, Rhode Island is particularly vulnerable to coastal hazards such as flooding and storm surge. 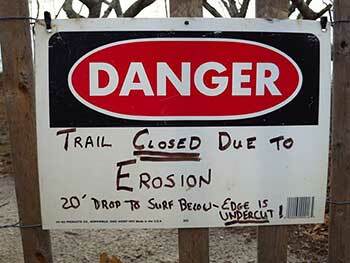 Exposed sandy shores — like Matunuck — can recede by as much as 30 feet in a single severe hurricane.